I made this cute name frame for a friend on mine who have a new grand baby "CHLOE", she loved it. I have had a heck of a time getting this on line (it kept turning sideways) so I kept at it and finally got it right. I hope you like it. 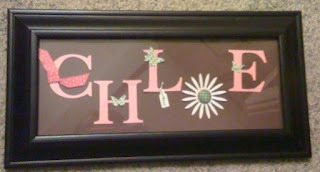 I will be offering a name frame class in July. Great for a baby's room or child's room or event. 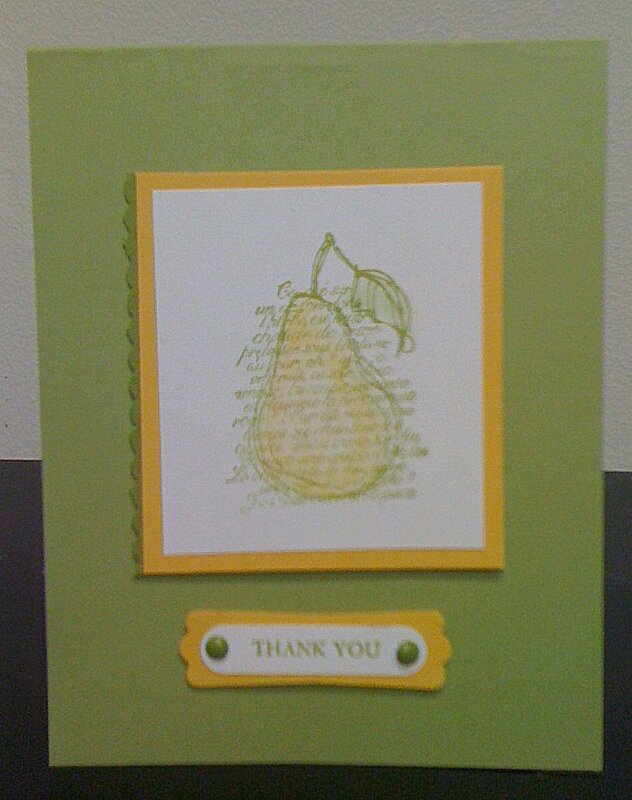 I made one for the fall and for the spring and for my bunco group. The possiblities are endless. Be sure to watch for my event for July coming soon. I used the tag punch and stamped sweet on it and tied it to the L. Love this project. I made my O in Chloe with a daisy die cut from the big shot collection. Love the way it turned out. Thanks for stopping by! 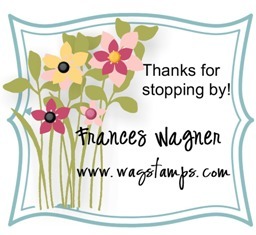 Normally I keep my blog for my Stampin’ UP! business but tonight I want to give a shout out to one of my friends/customers Gloria Fish and her friends; Shirley Sorrells, Jane Mize, Juanita Ball, and Charlotte Lewis. Some of you may remember in April of this year Raleigh NC was hit hard with a tornado. Since then an organization called North Carolina Baptist Men have come from different places to help people clear the trees in their yards and help them rebuild their homes and whatever needs to be done. These men are housed and fed at the Carolina Pines Baptist Church. There are trained teams to feed many people and to do the work for the houses that were destroyed. 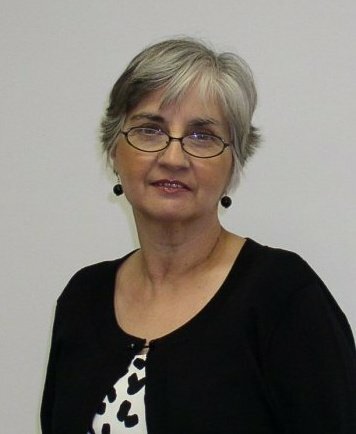 One day my friend Gloria went to the church after her husband went with a crew to cut trees and asked the lady in the office what could she do to help (she knew she could not handle a chain saw?) The lady said well the trash needs emptied! So Gloria said I could do that and from there she got other little jobs and then thought the men worked so hard and they needed someone to vacuum and clean the bathrooms and she started calling her circle of stamping friends and said bring your vacuum cleaner and meet me at the church. So being good friends and Christians they went. Now they do this three times a week. I am gathering some things for a friend and when I found these towels I had to make a cute tag to go with them. 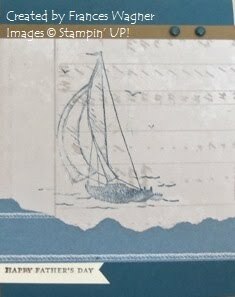 I thought that Sail Away was the perfect stamps for a tag for these cute nautical towels. 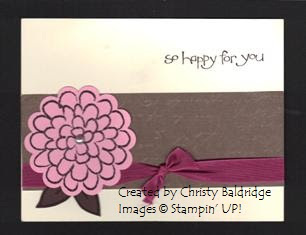 RESERVE YOUR 2011-2012 STAMPIN' UP! IDEA BOOK & CATALOG NOW! Please email your name and mailing address, if you would like me to order a catalog for you. The cost per catalog is $9.95 (includes priority mail shipping if you purchase your catalog through me). Hello my stamping friends, today while my sweetie was taking a father's day nap I made a card for a friend of mine and thought I would share it with you. Thanks for stopping by! Christy is on my design team and when I gave her supplies to make new samples with she came up with these. I love them. She did such a good job. Now I can show off some more samples at my classes, clubs and workshops. If you want to have a workshop please email me and lets get your date on the calendar! Remember this is the last month to order from the retirement list! Where did it all start? 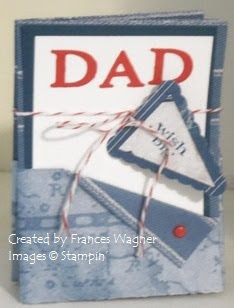 Do you remember what first inspired you for the love of rubber stamping? This coke crate that I found in my shed today is my beginning before I ever heard of Stampin' UP! I lived in Vero Beach, Florida and was good friends with two teachers Irene Testa and June Sullivan (June was actually the Jr. High Librian at the time) They are both soooooooooo talented in everything they do. One day I was at Irene's before the summer was over and she was creating fun things for her students and on the table she had painted a Coke or Pepsi (dont' remember which) crate and added little stamps in each hole like good job, try harder etc, you get the picture. She said she was going to hang it next to her desk so she could stamp on her students papers. I thought that was such a great idea. Soon after that I went to a craft fair that had a booth that sold stamps. I saw a outline pumpkin stamp and I bought it. The lady in the booth asked if I needed ink. Well of course I didn't I had the office black kind at home what else did I need. Oh mercy was I naive. So I went home and stamped that little pumpkin stamp with black ink and colored it in with an orange magic marker. So that was my first ink to paper. 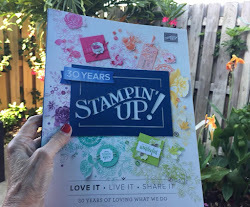 It took me about 9 years to find Stampin UP. A whole different story for another time. 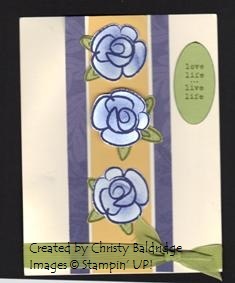 This is a card I made today that I was inspired from the new catalog sample, I used the Herb Expressions set that was in the current catalog but the good part is that it is still in the new catalog that I earned for my recruiting this year. I love everything about the garden and when I saw the booklet using this set in the new catalog I knew I had to work on a card with similiar images etc. 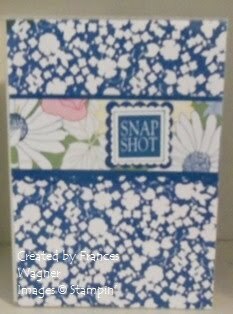 This is a cute photo notebook that I made using the new Beyond the Garden DSP in the Summer Mini. I love flowers and I love the way it turned out. 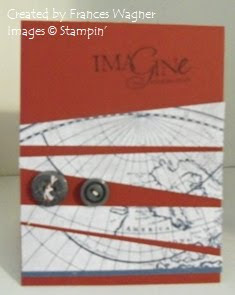 I also used the Snap Shot stamp in the Travel Log stamp set in the Summer Mini along with the new Postage Stamp Punch. This cute turtle card is the one we made at my Retirement Open House this month when the new retirement stamp list came out. Simple 3x3 enclosure card. 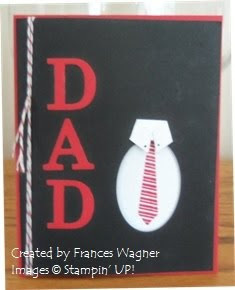 It's all about DAD! & Inspiration from Shelli! I thought you might like to sample of what is coming. I received some of my NEW 2011-2012 catalogs this week as well as my pre-orders! 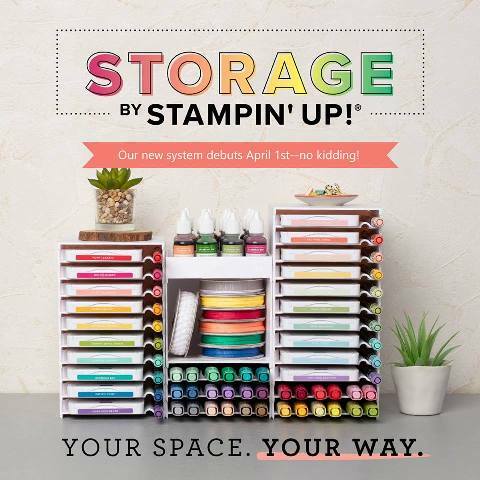 One of the perks for being a Stampin UP demonstrator is that we get to pre-order before the catalog goes live. I earned some items and purchased some items. 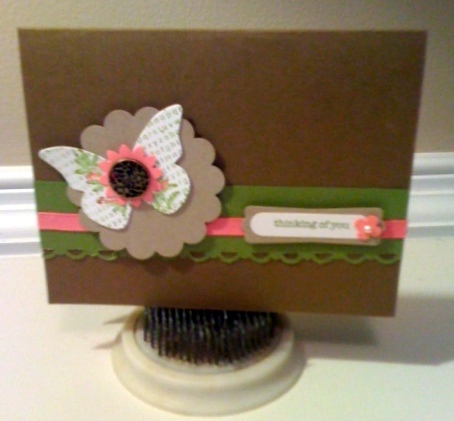 The card below I made with one of the new hostess sets "Faith in Nature". Stay tuned for more to come over the next few weeks. I love how the older colors coordinate with the new IN colors. Thanks for stopping by. You have been waiting for it and here it is! 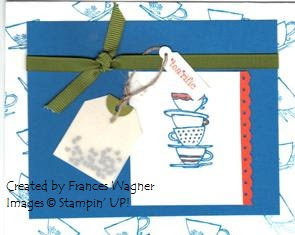 Just click Here to go to my Stampin UP Website and you can view the retiring stamps and accessories. Contact me if you have any questions.